Application Development, Systems, & Networking in Canton, Akron & Cleveland Ohio :: Himebaugh Consulting, Inc.
Now Hiring Systems & Networking Engineers! When you hire Himebaugh Consulting, you are hiring a team of professionals that can provide both web/software/mobile development, as well as general IT services out of Canton, Ohio. We can provide managed IT services, serving as either an extension to your IT department or as your primary IT resource which can be called upon as needed. Whether you're looking for help with web/software/mobile development, or need help on a server-replacement project or just need an on-demand IT resource for general computer problems, our Canton, Ohio team has the experience and expertise to make IT headaches a thing of the past. In addition, partnering with us gives you access to a wide-range of additional services often needed in web/software/mobile development projects including design, application integration, and both physical and cloud hosting. From the systems/networking side of the equation, we have deep expertise in all areas of Microsoft and Linux server technologies, as well as implementing cloud based infrastructure using both VMware vSphere and Microsoft's Hyper-V virtualization technology. Our web/software/mobile development and systems/networking staff has a depth and breadth of experience seldom seen in one company. If you have a business problem that can be solved by the use of technology, we can help. 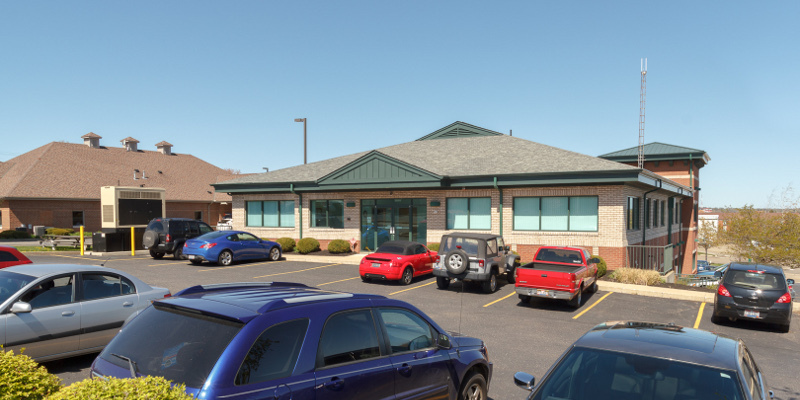 We've been right here in the Belden Village area of Canton, Ohio since 1993. If you'd like to see our in-house datacenter, give us a call or email, and we'll be happy to show you around. We host many websites right here in our facility as well as co-located servers. Some are physical servers, although most have moved to our redundant cloud infrastructure. Himebaugh Consulting is one of Canton's first website design and development companies, providing professional business websites and custom application development. We've been in business since 1993 doing website development - not many others have been around that long, if any. What this means to you, the customer, is that you'll be putting your trust and investment into a company that has a local presence and is committed to the local community. Another important difference between Himebaugh Consulting and other companies is that we've got our own datacenter to host your website or web application. It's not just a server in a closet, overburdened with hundreds of websites, all running slowly. In fact, ask us for a tour of our datacenter, and see where your website will be 'living' after it's developed. No outsourcing here - we have a team of web developers experienced in many programming languages. The depth of experience and knowledge in a firm which develops websites is important - you won't be locked in to the 'specialty' that is the only skill a small shop may have. To make an effective and fully functional business website, you need the right people behind it. 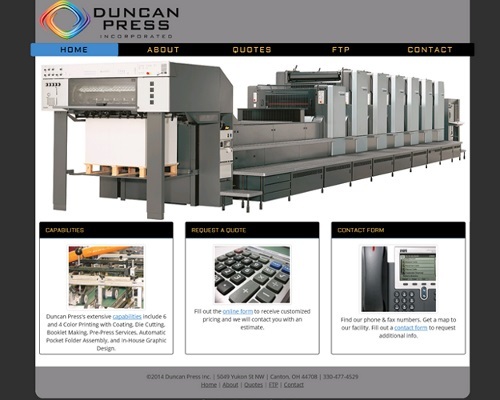 Duncan Press needed to replace their aging website on a budget. This mid-size website shows off the prepress, press room and bindery capabilities and offers an FTP site for their customers. 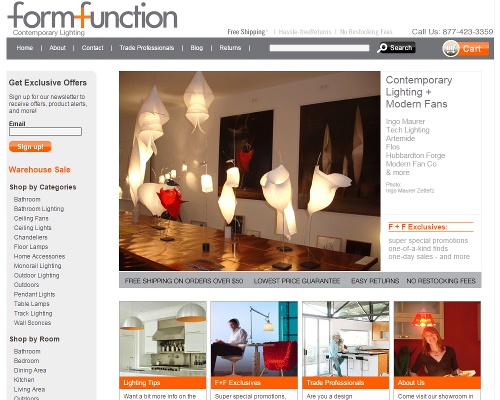 This e-commerce website sells high-end contemporary lighting. It includes an administrative interface with a custom-developed import tool for manufacturer spreadsheets of product data including images. A successful SEO strategy has been in place for years. 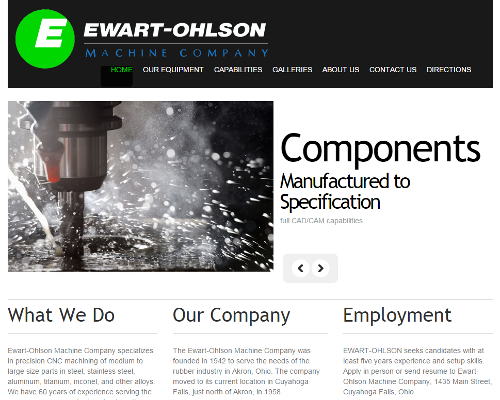 This Cuyahoga Falls machine shop now has an engaging website featuring their CNC equipment and describing their capabilities – including parts for the Mars Exploration Rover Mission. Himebaugh Consulting, Inc. offers custom application design and development for a range of platforms, architectures, technologies and devices. Often, the software that suits your specific needs simply isn't available in a package. When out-of-the-box software isn't sufficient or flexible enough for your business, we can custom-build to your specifications – efficiently – and deliver a solution that will save you time and money. Custom web applications work exactly the way you want them to. While off-the-shelf software can achieve partly what you want to do, the modification and customization of these tools is usually time-consuming and costly. Custom web applications can be built around your existing systems, bridging the gap between the old and new, or between two systems that need to 'talk'. Correctly coded applications are flexible and scalable. Custom applications work well for intranets, inventory management, document management and workflow control. Our custom web applications are built using open source technologies such as PHP and MySQL, which help you achieve better results at a reasonable cost. 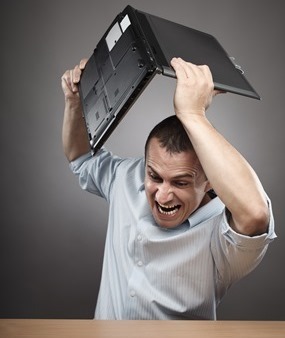 If computer issues have you frustrated, call us before you break something. We've got technicians to fix every problem. From Windows to Linux, from Microsoft SQL Server to MySQL - we've got you covered. Put down the hammer, and pick up the phone instead. We provide complete network design and setup, handling everything from planning to hardware procurement to implementation. We can help you design a completely new infrastructure that will be able to grow with your business, or modify your existing network to better serve your current needs. Businesses need to ensure that all of their computer systems are working correctly - and most businesses know that it's best to rely on experts in the field. We'll advise on hardware, as well as the deployment and maintenance of your server. This way, business owners can focus on the big picture rather than worrying about their internal systems and IT infrastructure. Increasingly, companies have been outsourcing many functions to reduce labor costs. Information technology (IT) outsourcing has allowed companies to quickly implement new technology and access talent for specialized areas such as disaster recovery, data storage and backup and application development. In VMware’s own words, virtualization is the process of creating a software-based (or virtual) representation of something rather than a physical one. Virtualization can apply to applications, servers, storage, and networks and is the single most effective way to reduce IT expenses while boosting efficiency and agility for all size businesses. Virtual private networks (VPNs) are pipelines for securely connecting remote employees to central work servers via the Internet. Most companies maintain VPNs so that employees can access files, applications, printers, and other resources on the office network without compromising security. We provide an array of network monitoring services. The available options include intrusion detection systems, packet-level analysis of your network traffic, and metered utilization of your network devices. Backup of vital company data is critical to a company's survival, no matter what size the company. Prepare for the unexpected, let Himebaugh Consulting work with you to form an effective recovery solution that is secure, reliable and tested.